The friendly club that enriches the lives of its members by providing an enjoyable golfing, social and recreational experience that fosters friendship and fellowship within a modern, traditional member owned setting. 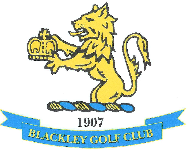 There is a lot more than playing golf in becoming a member at Blackley, although our re-designed 18 hole, mature parkland course is one of the best in the area and our superbly appointed clubhouse, opened in 2009, make it a pleasure to play. We offer a lively social scene with the vast array of well supported, special events in our superb club house which guests and visitors are encouraged to take advantage of. There is a chance to relax and unwind with a game of snooker, a drink, a snack or a meal, whilst catching up on the latest from Sky Sports in our well appointed bars.